There are two components to the procedure. First, a small stomach pouch, approximately one ounce in volume, is created by dividing the top of the stomach from the rest of the stomach. Next, the first portion of the small intestine is divided, and the bottom end of the divided small intestine is brought up and connected to the newly created small stomach pouch. The procedure is completed by connecting the top portion of the divided small intestine to the small intestine further down so that the stomach acids and digestive enzymes from the bypassed stomach and first portion of small intestine will eventually mix with the food. 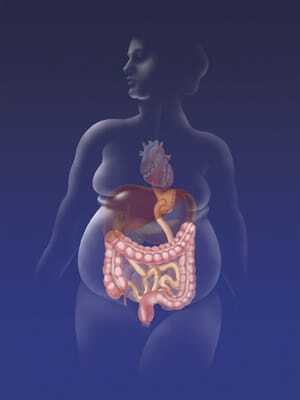 The gastric bypass works by several mechanisms. First, similar to most bariatric procedures, the newly created stomach pouch is considerably smaller and facilitates significantly smaller meals, which translates into less calories consumed. Additionally, because there is less digestion of food by the smaller stomach pouch, and there is a segment of small intestine that would normally absorb calories as well as nutrients that no longer has food going through it, there is probably to some degree less absorption of calories and nutrients. Most importantly, the rerouting of the food stream produces changes in gut hormones that promote satiety, suppress hunger, and reverse one of the primary mechanisms by which obesity induces type 2 diabetes. Am I A Candidate for Laparoscopic Gastric Bypass Surgery? Gastric Bypass Surgery is not right for everyone. Here are some of the things we will consider when evaluating your candidacy for gastric bypass surgery. The Bypass Procedure is indicated for use in weight reduction for severely obese patients with a Body Mass Index (BMI) of at least 40 or a BMI of at least 35 with one or more severe co-morbid conditions, or those who are 100 lbs. or more over their estimated ideal weight. While the bypass operation is an effective treatment for morbid obesity, the pounds do not come off by themselves. By-pass surgery is an aid to support you in achieving lasting results by limiting food intake, reducing appetite and slowing digestion. However, your motivation and commitment to adopt a new lifestyle are extremely important for long-term weight loss. You must be committed to new eating habits for the rest of your life. Exercise is an equally important component of a changed lifestyle. This is a non reversible procedure so it is considered permanent. This operation is very complex and therefore it has several disadvantages in comparison to the sleeve and Lap Band. The stomach and lower bowel is cut, stapled and rerouted which can result in leakage or possible stenosis or smaller opening. Patients who eat foods that are high in fat and sugars may experience “Dumping Syndrome”. This is a result of the intestine not able to absorb the fatty foods and the patient will experience gastric distress such as nausea, vomiting, cramping, diarrhea and possible sweats. The last adverse effect could be vitamin deficiencies of important nutrients such as Vit D, calcium, B complex, magnesium and iron. 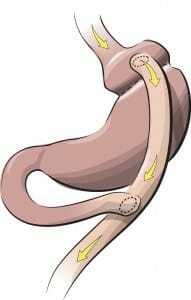 What is involved in a Roux-en-Y gastric bypass procedure? Roux-en-Y gastric bypass is the most commonly performed bariatric procedure. This method makes the stomach smaller and alters digestion. It is referred to as a combined restrictive and malabsorptive procedure because less food can be eaten and fewer calories can be absorbed. What is the recovery time following Roux-en-Y gastric bypass surgery? Most patients recover from surgery without complications. Patients are encouraged to get out of bed and start walking by the next day. The hospital stay for patients who undergo the Roux-en-Y procedure is usually two to three days. Most individuals return to work in two to three weeks. When is bariatric surgery considered successful? Weight-loss surgery is considered successful when a person loses 50 percent of his or her excess weight. Although few people lose all of their excess weight, they do gain numerous health benefits, which may be lifesaving. It’s important to remember that there are no guarantees with any method of weight loss, even surgery. Success hinges on your ability to become part of the plan to support the surgical tool you’ve chosen and make lifestyle changes with exercise and dietary adjustments. Are there activity restrictions following bariatric surgery? Yes, strenuous activity should be avoided until you are healed. Walking, however, is a required activity at this stage of recovery. You are advised not to drive if you are taking pain medication other than Tylenol. At your first follow-up visit, your doctor will determine when you can return to work, but most people return to work two weeks after surgery. Will I have to take dietary or nutritional supplements for life? The gastric bypass provides two ways of weight loss one is restriction in the amount of food that you can eat and the other is through malabsorbtion. Due to the combination of this procedure you are required to take vitamin supplements daily especially calcium, Vit D, B complex and iron. You should also follow up with your surgeon annually to have your weight checked and blood work completed to measure your essential vitamin levels. What about exercise after gastric bypass surgery? Is it possible to gain the weight back after gastric bypass surgery? Bariatric surgery has an excellent long-term track record for helping morbidly obese individuals maintain weight loss. If you are committed to making permanent dietary and lifestyle changes, your chance of weight re-gain is minimized.